Oh, this is very nice for all you Flashers. It’s free, it’s at the Barbican in London, and Jodie O’Rourke, who came to visit the Flash group this year, is speaking at it. With all of the big announcements at the annual Adobe MAX conference in LA, we bring you a “Back from MAX” special where aim to cover the new tools and technologies announced at the conference… many of which are available for you to download and use right now. Join us at the Barbican in London on 2nd December for a day of insight and inspiration. Topics will traverse the Flash Platform, from new features available to Flash Professional CS5, to building and testing mobile apps with Flash Builder Burrito and improved workflows in Flash Catalyst Panini. Learn how to easily target multiple screens, including Google TV and AIR 2.5 for TV devices. Whether you’re just getting started with the Flash Platform, or consider yourself a pro, there’s something for you! There’ll also be giveaways galore! 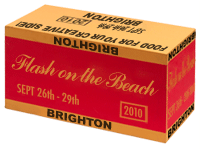 Adobe and Flash on the Beach have very kindly arranged for a 20% discount on tickets to this annual event – the biggest Flash conference of it’s kind on these seashores. Tickets are normally £399 for a three day pass before 4 September – so you get it for £319.20 by my reckoning. John and Alun from the User Groups will be going at least, so contact us if you want to get the discount code. If you are a designer, developer, coder, student, manager, game developer, artist, animator or a newbie, then this conference is for you! Don’t miss this opportunity to see nearly 60 of the best minds in the industry, delivering 3 full days of awe-inspiring sessions, plus one day workshops that will give you in-depth training from the worlds best speakers! Again we have another phenomenal line up of speakers. We also have the perfect place for them! We love our Brighton venue! The Dome has so much history, charm and character, we would be mad to use anywhere else, and are already looking forward again to the most exciting Flash conference for years! Don’t think of FOTB as just another Flash conference. The Flash bit of the title is more a mentality or vibe than just software product. What do we mean by that? Well, Flash is one of the coolest web tools around. It breeds a vibe that sets it apart. The Flash community is very supportive of each other. They share, talk, blog, help, experiment and share some more! They do not limit themselves solely to the product called Flash either. They design, create and deliver some of the best experiences on the web using a wide variety of tools and skills. Don’t think that Flash on the Beach is only about Flash. Sure appearing at FOTB in the past we have had the usual suspects – Flash, Flex, AIR, and then some. Open Frameworks, Processing, AJAX, Photoshop, After Effects, Art, Design, Illustration, Animation, Sound and many more. Whether you are a tech-head or a creative, if you are a decision maker or a team manager, if you are in need of a fix of creative inspiration, or want to know the latest how-to’s, Flash on the Beach is where you’ll get it. So, go ahead, contact us if you want that 20% discount, and we’ll give you the code. Today the BBC front page highlighted news of the release of Android 2.2 devices and Flash on mobile devices. Good news for Flash developers? Advance notice of an online discussion about Adobe’s Open Source Media Framework. Join us for an overview of Adobe’s open source media framework — what it can do and how you can use it in your current projects. You’ll learn how OSMF can help you create rich media experiences online and how the new development framework can increase monetization opportunities with your media assets through direct integration with advertising services for tracking and reporting services. Developers can use this framework to create media viewing environments that drive longer view times and leverage the latest features such as Dynamic Streaming and DVR from Adobe Flash Media Server. Read more at the Adobe Groups page. Sign up on the right of this page, or on the Google Groups website, and we’ll send you notifications of meetings and any other news we can think of (but not too much! ).